Since the beginning of 2010 it seems that we have had nothing but grey skies in Paris, but that makes this colourful new mural on the Rue Saint Maur all the more refreshing. This fresque is the work of an American artist called Matt W. Moore (his blog can be found here) who recently spent a month in Paris, working on a series of canvases in addition to this creation. 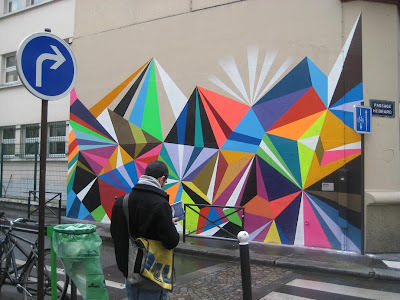 He was given permission to paint the fresque, called 'Crystals and Lasers', by the Mayor of the 10th arrondissement, and it is rather amusingly placed on the side of a school. Local residents are apparently delighted to have this work here and it is easy to see why, with the shapes and colours giving depth to a previously non-descript grey surface. As Moore says himself, "geometry is a universal language, and bangin' color is crucial during the cold grey winters here". Moore's paintings, along similar lines, can be seen in a new gallery situated opposite this mural, the Since Upian Artspace (Monday to Friday, 2pm to 7pm, 211 rue Saint-Maur 75010) until the 12th March. Inspired by the hypercolours of MWM, here are two more impressive displays I have found in a city which can sometimes be dispiritingly grey! Lovely embroideries on the grey stone - or do I mean cave painting? I am really looking forward to see this street art piece if it is still there next month. Lovely brights colors cheering us up with this grey sky! Urban art is often nice, this is a good example. Celine: I think this piece is permanent, so should certainly still be there when you visit. 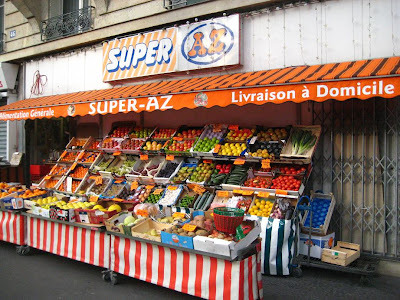 I saw another great 'pochoir' around the corner from there; a black cat with 'Ni Dieu, Ni Maitre, Ni Croquettes' next to it! Peter: Good question about the delivery vans - one to look into! 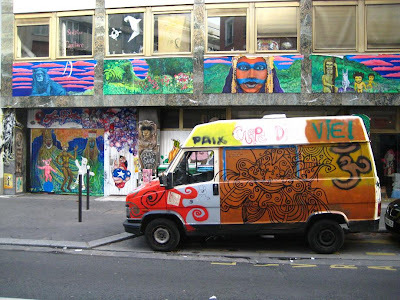 In this example, my question was whether the van is part of the colourful building behind or just a happy accident! Love the first picture; the colors are so vibrant. Very much like the subject of the second picture. Don't care much for the graffiti in the third. What Happened to la Moutarde Bornibus?